Oh what a great day today! First we did the Corona del Mar Scenic 5K, a beautiful run/walk with a view of the Pacific Ocean. Then we spent some time by the pool enjoying a gorgeous Southern California afternoon. 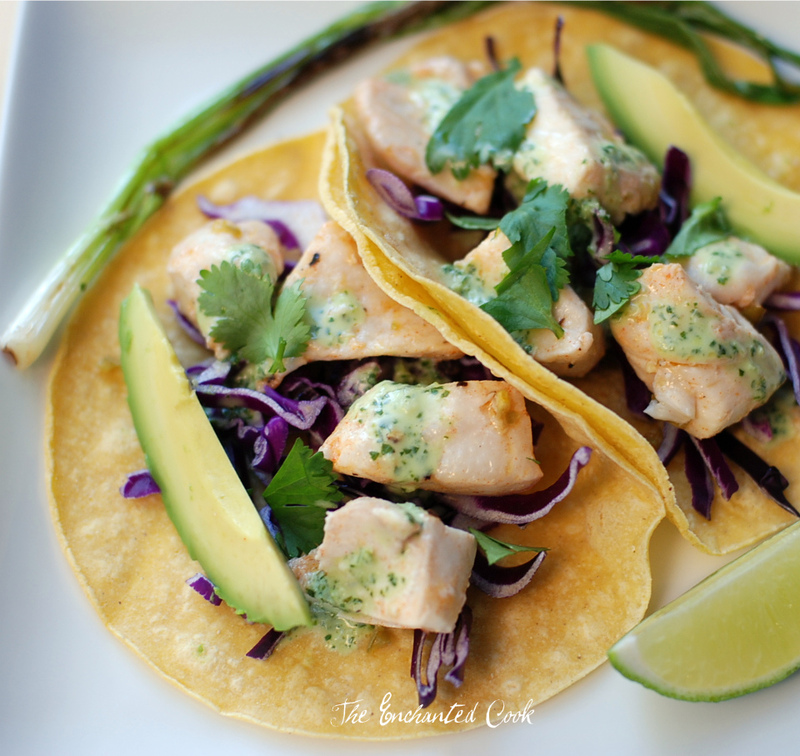 What better way to end the day than with some delicious and healthy fish tacos? I even lightened up the dressing using Greek yogurt. And these tacos are quick to make. About 35 minutes total time in the kitchen. First you whip up the quick marinade for the fish. While it's marinating you make the dressing. Then you put the fish in the oven and while it's cooking you get your setup ready. Pull the fish out of the oven, assemble your tacos, and eat. So easy! Pour marinade over the cubed and salted fish, turn to coat, then place in refrigerator for 15 minutes to allow to marinate. While fish is marinating, prepare your dressing. Place all ingredients for dressing, except olive oil, in food processor and blend until it's a smooth consistency and ingredients are well mixed - about 10 seconds or so. Next while the food processor is running, drizzle in the olive oil through the spout. Taste for seasoning and add additional salt or pepper if needed and set aside. Remove fish from refrigerator and drain off the marinade. Place fish in a shallow baking dish and place in oven. Cook for approximately 15 minutes or until fish is opaque in the center and flakes easily. While fish is baking get your setup ready - shredded cabbage, sliced avocado, lime wedges, chopped cilantro. When fish is almost done, heat up your corn tortillas. When fish is done, remove from oven, assemble tacos and enjoy.